This business, which is based in Gordevio (in the Maggia Valley) was set up by Bruno Vanetti in 1968 and has been run since 1995, when it was transformed into a limited company, by his son, Pablo, who has been working in the family firm alongside his father since 1987. 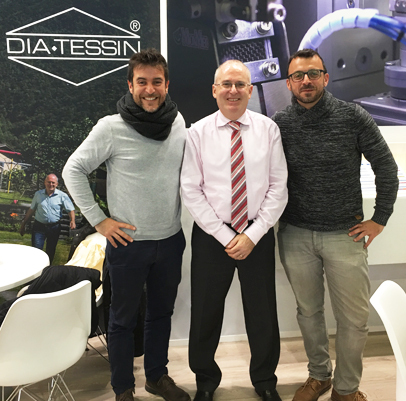 It is specialised in the manufacture of technical instruments for dental surgeries and, during the initial years of its existence, was active primarily on the Swiss and Italian markets. In the course of the 1990s, especially after Pablo Vanetti became involved in managing it, the company, although retaining its size (a headcount of eight, including the proprietor) and its nature as a family–run business, has progressively expanded its market to reach international dimensions. Today, products bearing the Dia Tessin brand are sold not only in Switzerland and Italy but in all of the following countries: Albania, Armenia, Australia, Austria, Azerbaijan, Belarus, Bulgaria, Bosnia, Canada, Costa Rica, Czech, Egypt, France, French Guyane, Germany, Greece, Holland, Hong Kong–China, Iran, Iraq, Japan, Jordan, Kazakhstan, Kosova, Korea, Kuwait, Lebanon, Lithuania, Luxembourg, Martinica, Mexico, Moldova, Philippines, Poland, Portugal, Qatar, Romania, Russian Federation, Saudi Arabia, Spain, Syria, Thailand, Turkey, Ukraina, United Kingdom, USA and Uzbekistan. Vanetti SA promotes its products through its active participation in international trade fairs, through mailings and through the use of advertising inserts. Above all else, however, its sales may be ascribed to the “references” provided by its established customers, who are evidently highly satisfied with the service they have been receiving. Vanetti SA also makes full use of computer systems and, as of 1999, is to have its own web site. In order to make sure it obtains the quality that is essential for marketing its products, whilst remaining competitive in terms of prices, Vanetti SA has pushed the automation and rationalisation of its manufacturing process as far as it can. In this context, the certification procedure has proved useful for the purpose of reorganising the company – a process the proprietor had already launched of his own initiative beforehand. The company´s policy can be reduced to a simple–sounding formula: top–quality products with short delivery times (a week at most), rapid processing of complaints, support for customers in making the Dia Tessin brand even better known, reducing scrap to an absolute minimum and guaranteeing perfect harmony throughout the whole company.